New season for the italian pitchers. 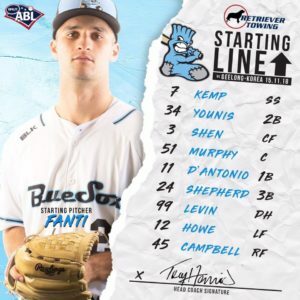 The undefeated Sydney Blue Sox (4-0) kicked off the 2018-2019 season Italian style when 33-year-old starting pitcher Alessandro Maestri earned the win by throwing five innings, striking out 11 hitters, and limiting Geelong-Korea to one earned run in the Australian Baseball League (ABL)home opener at Blacktown International Sportspark on November 15, 2018. Sydney Blue Soxmanager Tony Harris called on Team Italy‘s Nick Fanti to start the following game on November 16. The 21-year-old New York-born lefty, who made hisAzzurri debut in the 2017 World Baseball Classic, pitched 3.1 innings and allowed one unearned run while striking out three Geelong-Korea batters and leaving the game with a commanding Sydney 4-1 lead. A 31st-round pick by the Philadelphia Phillies out of the 2005 MLB Amateur Draft, Nick Fanti completed his fourth season in the Phillies minor league system with Single-A Advanced Clearwater Threshers before heading down under to Sydney to join fellowTeam Italy pitcher and mentorAlessandro Maestri, who was recruited to pitch in Australia the first time for the Brisbane Bandits during the 2011-12 ABL season. As the workhorse of the Brisbane Bandits pitching staff, he led his team in wins (4) and proved to be one of the best pitchers in the league. Alessandro Maestri finished third in the ABL in innings pitched (63.2) and in strikeouts (53), fourth in the ABL in WHIP (1.16) and sixth in the ABL in ERA (3.25). In round eight of the regular season, he earned the ABL Pitcher of the Week award after pitching a stellar complete game two-hitter against the Canberra Cavalry and was later crowned with the prestigious ABL Fan Choiceaward. Now the first-place Sydney Blue Sox have the necessary one-two Italian punch of Alessandro Maestri and Nick Fanti in the starting rotation to make a run for the ABL Championship title. Let’s wish both pitchers the best of luck during the 2018-2019 ABL season. Follow all the action on ABL TV by clicking HERE.